In some cases, people will collect contacts, messages, videos and their family pictures that others send to them. Or, they may take a lot of pictures themselves at special events and occasions. Whatever the case, an Android phone can be used to create an entire collection of pictures that people want to save permanently. With that being said, there are many reasons to save this information to the phones that they have in their possession. Therefore, whenever an individual has an old Android phone that they may be switching out for the new iPhone 8, iPhone 8 Plus or iPhone X or iPhone XR, iPhone Xs, iPhone Xs Max, they will need to transfer everything that they have saved on the new iPhone including contacts, SMS, videos, music, and other files so that they can continue to have access to this data. To transfer data from an Android phone to iPhone X/8 Plus/8/XR/Xs/Xs Max, you need to draw support from a third-party phone to phone transfer tool because they are running different operating systems - Android and iOS. 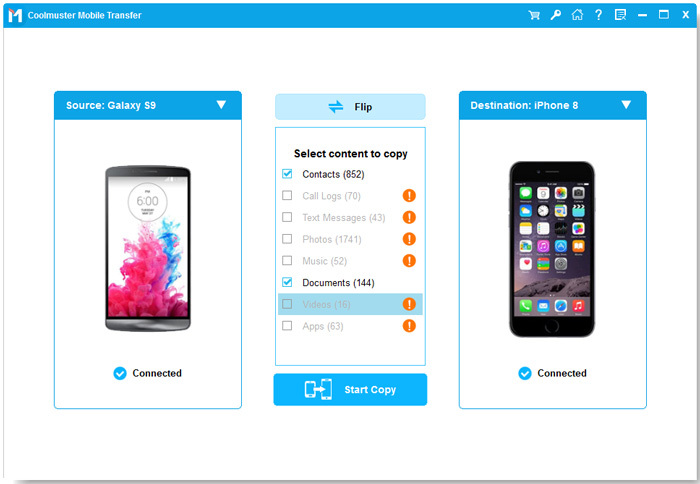 The tool you need is the Coolmuster Mobile Transfer or Mobile Transfer for Mac, which helps you transfer contacts, text messages, photos, videos, music, apps and more from Android (Samsung, HTC, LG, Sony, Motorola, ZTE, Huawei, Google, etc.) to iPhone 8/8 Plus/X/XR/Xs/Xs Max with 1 click. It is pretty easy to use. 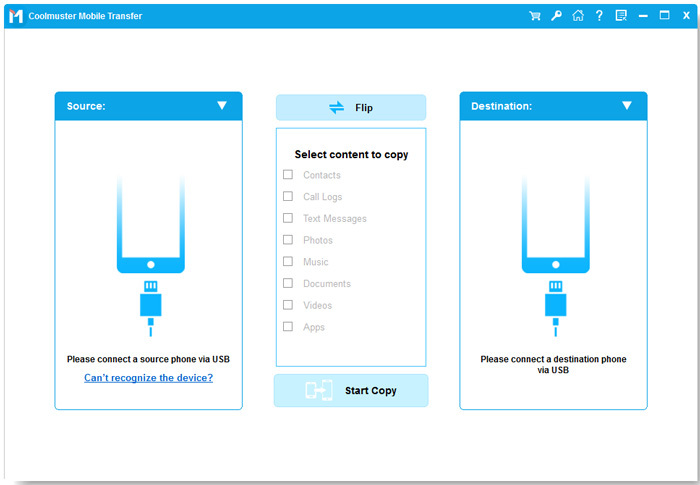 All the user has to do is download the application, launch it, connect the 2 devices to a desktop or a laptop computer and then follow the 3 part step by step instructions that walks the user through the process of making the transfer from Android to iPhone 8. Read the following guide to learn the details. 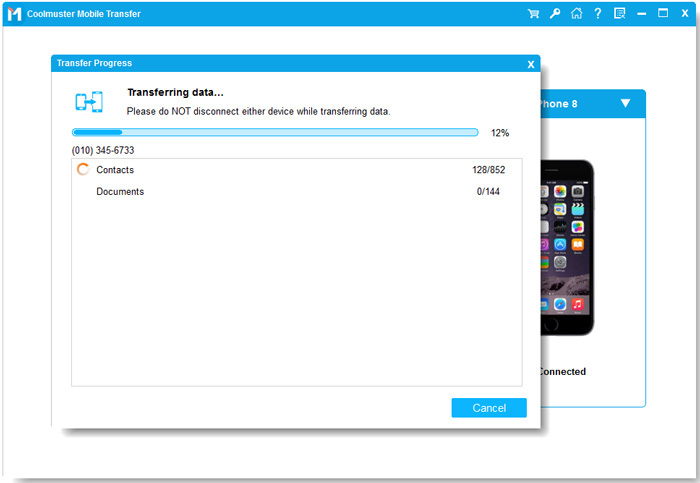 How to Transfer Data from Android to iPhone 8/X/XR/Xs/Xs Max? Download, install the transfer tool on your computer and launch the program to get ready. Then, you will get its primary interface like the picture below. You are required to connect your two phones to the computer via USB cables. Pick out two USB cables to connect your Android phone and iPhone 8 or iPhone X or iPhone XR, iPhone Xs, iPhone Xs Max to the same computer. Once both cables have been connected to both the phones and the computer, you will see a new window that shows the two mobile devices and all file types that can be transferred with the program. Tick those file types you want to transfer (i.e. contacts, documents, etc.) and then click on the "Start Copy" button to kick off the transfer process. Wait until the entire process gets over with, and do not disconnect either device.